There are many reasons to put some thought into an audit process for your load jobs. 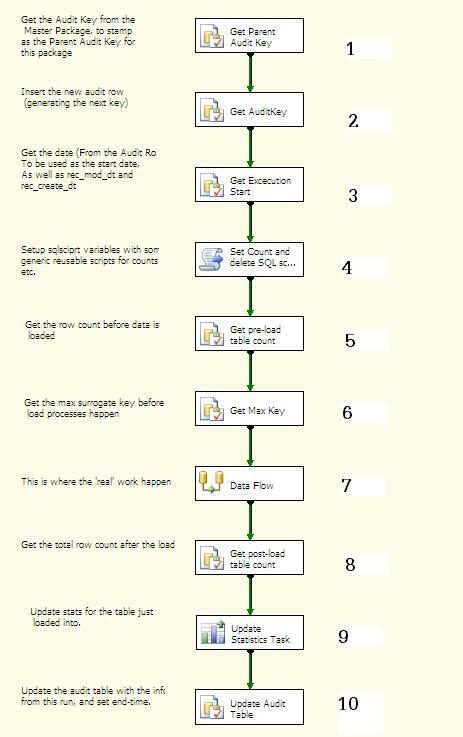 Tie the insert/update of a row to a specific SSIS package. Provide consistent date-stamp times for a given load (I will explain this in a moment). Ensure all the data staged actually made it to the target. Monitor load times, and easily find packages (or tables) that need tuning. Provide SLA reporting information on load-times. Probably a few other things that you will discover as you implement this. Once you have the table, the view (in the default dbo schema) also calculates the execution time and executes with a NOLOCK, you want to be sure there is no locking by your monitoring processes on this table. Now that you have the basic table and view, the first thing your load will do is insert a row for the “Master Package” , which will create a new with a -9999 parent_audit_key to tie all of your “sub” executions to, and creates the exec_start_dt of this particular execution. You now have an option…. you can select back the identity column you created, and pass it into each of your packages that you execute, or let each package lookup to get the audit-key that they will use as the parent_audit_key. I DO NOT pass it in, but rather lookup at the top of each sub-package. Reason 1, I execute all the sub-packages as out-of-process, to obtain a separate memory space for each of the executions, as I am running MANY processes in parallel. Reason 2, restartability, if each package functions as an independent unit of work (including looking up the parent_audit_key) if a package fails for any reason, it can be re-run by itself without having to invoke the master-package, or manually adjusting variables etc. If you are using checkpoint files for restart this still plays well with that as the existing variable states (including audit_key assigned to the package, as well as parent_audit_key, record counts etc) are preserved for restart. If you have been reading any of my other posts, by now you have figured out I am “stuck” on naming conventions and consistency, but if you open ANY load package, they all look the same, so lets walk through the parts. Insert a new row into the audit table (VARIABLES for everything in the insert)…This is cut-paste for any package. This will select the package start-time from the audit table row. This will be used for the rec-mod/rec-create dates in ALL rows affected by this load. We are effectively going to tie all of the data in the warehouse back to a specific audit row, and a specific execution time. If data needs to be backed out due to source issues or otherwise, all rows affected by the run, all have the same time. Using a scripting task, (same result as using an expression build in bi-express product if you have that). This task sets SQL statement variables that will be executed before (and after) the load. Executes the count sql statement just built by the scripting task by using the table-name variables in the package. This is the ONLY unique thing in this package. EVERYTHING else is driven by the variables and dynamic SQL. There are many reasons for consistency… audit and maintainability is a major benefit. The audit will produce a row in an audit table that you can tie ANY row in the warehouse (dimension or fact) back to the specific execution of a package. The audit table will give you execution times for packages (which is very useful to monitor ongoing load-times and bottlenecks). It may seem like a lot of work up-front (it really is not), and since all of the infrastructure is driven by dynamic sql, and variables, there is nothing (other than changing the values in variables) that needs to be created to maintain a consistent audit process. I am glad I came across this, it was very, very helpful in explaining the process. nestled in a 50 metre deep crater.